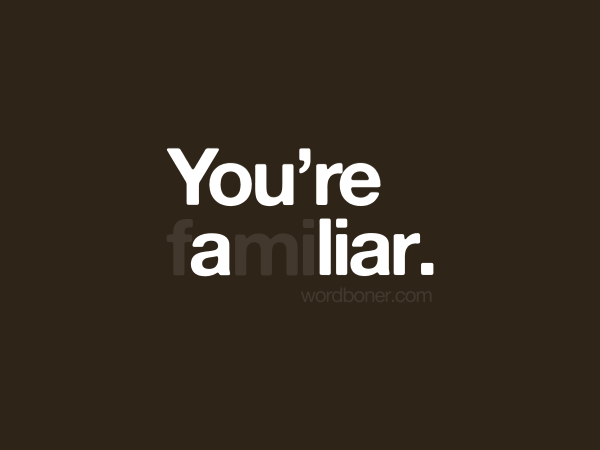 You’re a LIAR!! Yes, you and don’t freak out when as accused; we are all liars to varying degrees. It’s hardly my style to address such a negative aspect of the human condition, but we can’t ignore that “lies” constitute a rampant state prevailing in politics, the business world, and even in our daily exchanges as minor fibs. Studies do show that the average person lies several times a day either concealing or fabricating the truth for silly reasons sometimes. We dismiss many as “white lies” being socially conditioned to be respectful and polite (e.g. you’d respond when asked how you’re doing by saying: “I am doing great!” when deep inside your world is gloomy and chaotic). We deceive, also, without intention mainly in social conversations (e.g. like nodding when listening to someone talk while our mind is wandering elsewhere). You do it; everyone else does it! Unless you’re living in complete harmony with yourself and others, you’re “lie-free”. And when you do knowingly lie, you give yourself so many excuses and rationalize every time. It could be to protect from bigger harm, safeguard the other person’s feelings, avoid unnecessary conflict, preserve a good self-image, handle high stake situation, and the list goes on and on…. I am not suggesting that because deception is very common, you remain at ease with it. An inner state of dissonance and stress emerges for those who are conscientious enough, or good meaning (not the cunning malicious type). When you’re at the receiving end, the feeling is even worse. It’s not these small innocent lies that get to you. It’s the deliberate biggies (e.g. being betrayed) or when it’s too frequent or manipulative to serve the liar’s hidden agenda. To explore lying and deception, is to understand it, as to better deal with it. Let’s dissect it here. Why can’t you tolerate being lied to when you yourself lie from time to time? Mainly, and when you first react, you may forget to justify for others as you do for yourself. You’re not in the liar’s shoes to know their drives. It certainly is not easy to swallow those biggies, tolerate habitual chronic liars who adopt lying as their natural style, or accept the Machiavellian type who manipulate you to serve their needs. Big lies that relate to specific situations can become traumatic especially from those you least expect to deceive you. The frequency of smaller lies – no matter how trivial these are – can similarly, drain you. You’re always left scratching your head (asking yourself “shall I believe this now or not”). You may try hard to let these slip by, but their recurrence can become impossible to ignore. Manipulative deception has a far greater toll. They shake you to the bone. With children, you can understand lies as a sign of immaturity, but with adults, you can’t help but consider them as having an evil tongue frustrating enough for you to reassess your whole life philosophy and strategy. Eventually, you may become more cynical, suspicious, and completely pissed off. Until you understand the liar’s reasons, you keep boiling inside. For sure, you first take lies personally as a threat to your own self-image. What does it mean to be lied to? Lies – big or small – hurt your ego and are translated in the most degrading terms: you’re unworthy of the truth, your intelligence is insulted, you’re considered gullible, your bright expectations are violated, you’re naïve for believing, or simply that your good faith in others led you to being taken advantage of. You doubt yourself; and your trust hub in others gets destroyed. It then becomes extremely difficult to mend the fences. A big lie can leave you vulnerable, forever suspicious, uncertain, out of control, or experiencing great suffering and pain for a while. It happens, right? The truth is: lies really tell more about the deceiver than it tells about you. For big lies, always consider the ramification for telling the truth in context. It could just be that the other person is so scared of facing reality. You could have done the same if your roles were reversed. With habitual liars, many are not even aware of their behavior since it becomes more like routine so well ingrained and automatic. Their excessive lying may have routes in their having an inferiority/superiority complex. These usually have an instable sense of identity with conflicting parts struggling within. If they were clearer on how they defined themselves, or knew what they really wanted, there would be no reason for them to lie. It could, also, be that they were raised in an environment in which lying was necessary for survival. They become addicted to lying as it feels right and safe; thus, twisting all truths as a way of living. Manipulative liars obviously adopt lying to get what they want in a sneaky way. They have little empathy for your feelings. It’s like they coerce you into doing something you wouldn’t want to do in the first place; hence, you feel utterly disgusted when you find out their true motives. How easy is it to detect deception? Many lies are discovered by contradictory statements or by piecing together information to make sense of things that don’t seem right. This is often fuelled by an internal lie detector we call “gut instinct” that picks up on so many unconscious cues. The literature is bound with guidelines on detecting lies through observing non-verbal behavior. These include: more blinking or fidgeting, speech hesitation, shorter responses or even too much detail, changes in vocal pitch or speed, language patterns (e.g. frequently dropping the “I” from a sentence), breaking eye contact, or even its opposite of being looked at too insistently to make a point. However, and to date, there is enough evidence that even trained professionals cannot detect deception with precision. You may assume that because you know the other person too well, you can easily spot lies, but that’s not straight forward. With enough determination, a liar can cover the truth well especially the manipulative type. It’s even more difficult to know with chronic liars, as it’s all too natural and reflexive. They themselves believe their lies. In the end, there’s no foolproof way to know when a person is lying for sure by mere observation. Many lies would eventually be discovered somehow. Knowing the truth sets you in turmoil, so ideally, what are you to do? How can you deal with being lied to? Understand again, it’s a sad human condition. Nail it down to being situational or chronic. Is it justified or is it that the other person is being a pathological jerk? a) With situational liars and big lies: Be cautious of someone who gives you a one-time BAMM!! They lie once, they can lie again. If you care about salvaging your relationship with that person, it’s best to address the issue in a more conversational manner (as opposed to a confrontational style); and only when you have calmed down. Think of the reasons for why you were lied to and the consequences of telling the truth in time. They maybe too scared to face the problem or cannot handle the truth, but you can show them that you can (with some extra effort in certain respects of course). They simply may be asking for attention indirectly. If you do confront, refrain from throwing accusations. It’s counterproductive, as it breads their defensiveness (e.g. withdrawing, counterattacks, denial, or hostility). Focus in your discussion on how it makes you feel to be deceived. Give them a sense of understanding and willingness to deal with the problem and the underlying motives for lying. Always reciprocate by telling the gentle truth as you remain in control of your emotional reactions (that’s the toughest to handle in such situations). Your discussion can eventually lead to a clearer understanding of the whole issue at hand. If things make sense, then be sure to forgive. This way you’ll be the “bigger” person who accommodates for human faults. Holding a grudge occupies unnecessary space in your heart and leaves no room for working things out. Besides, we all deserve a second chance, so allow it. But what if lies are repeated over and over again? You’re on alert mode already if you’re lied to once. It takes time and repeated evidence of sincerity to regain that lost trust – if ever. b) With habitual and manipulative liars: Those who lie chronically for no apparent gain are to be pitied. Remember that it’s about them (i.e. their personality and life experiences). Even if they were not lying to you directly but to others, you’d reason they could easily lie to you too. You can try to let things slide if they are not important, hint at inconsistencies, or use sarcastic remarks paralleled with surprised facial expressions. If lies stretch too far, you can handle it using some humor to point it out (e.g. say something like: “Come on Pinocchio, your nose is growing!”). It is very difficult to change habitual liars as most of the time they lack insight. They are better referred to a professional in counseling; and it’s very common that they’d resist doing until they hit bottom. Others, who are manipulative and adopt lying for strategic purposes, are to be avoided as soon as they are discovered. Withdraw from further dealings with them if you can. If you’re stuck with these because the situation dictates (e.g. they are colleagues at work or are family), you cannot but resort to standing up for yourself and setting clear boundaries. Asking more questions for clarification would be like inviting in more lies. One lie may just have been leading to another to make the picture more complete in the first place. In all cases, you really need to set yourself emotion free from the frustration of feeling like an idiot. Deeply reflecting and assessing the situation objectively can alleviate your first outraged reaction when you discover the truth. People have different reasons for deceiving; and if they are good meaning, then work on substituting resentment with empathy and understanding. As hard as it is to be lied to, you need to remember the times you were cornered into lying and had all proper justifications. And don’t forget that sometimes you even deceive yourself just to be happy by denying or ignoring the truth. These are only adaptive defense mechanisms we resort to without conscious attention. When liars deceive, their intentions are good to, at least, themselves. You can only remain alert, empathetic, and self-protecting too. Despite lying being a violation of all ethical and legal principles, we can only tolerate and accept such a – not so pleasing – human condition. Don’t fret about it too much. It’s not easy to live in complete harmony without concealing some truth until one day you’re there. Dania, this is thought-provoking. It did cause me to do some self-examination on this topic. I know I have little tolerance for lies, though I do try to look for the underlying reasons whenever I can and to cut people some slack when I am able. Like many, though, I consider myself a truthful person but had not fully looked at the whole picture. I agree that we all do lie sometimes about something. We just don’t enjoy admitting it and I am no exception, because it contradicts my image of myself. I do it rarely but can’t say I have never done it, even if sometimes I have felt there was justification. What a helpful approach to work on substituting resentment with empathy and understanding as much as we can. When our trust is betrayed repeatedly or in a significant way, though,, and we are always forgiving at our own expense, there is more self-examination to do about why we think so little of ourselves, in my opinion. I hear you! We must find the right balance between being warm-hearted, ethical and respectful of others’ needs and motives, and going to the extreme of not looking out for ourselves and overlooking our own needs and rights. We should indeed work toward being at ease with ourselves and our lives, but one thought of mine is that we don’t want to be “too much at ease” because then we are not challenged. Sometimes we do get tired of the challenges but we continue to grow through them. on. You’ve done an impressive job and our entire community will be thankful to you. Dania, thanks for this. It was really useful. Helped me come to terms with myself. I had started to believe that I am the guilty one here for being lied too. Very well written. My friend once told me, “‘Things’ come in pairs: crown and coke, jin and juice, and honesty and haters.” People hate liars but also blunt honesty. I rather be hated for my honesty than for lies that will soon be revealed. I really have no empathy for the non-logical. I won’t say I don’t lie because really lying is about perspective and perspective is reality. I will say though that I do not forgive those who deceive for personal benefit or out of personal fear. I was lied to by somebody I thought I could trust and would be there in the time of need like I have been there but I was so wrong. The person I believed I could trust lied to me to protect someone who hurt me not only in the past but also recently. This help me to realize that I am not to be blame for another person lies even when they told me it was for my benefit but couldn’t tell me how them lying to me was beneficial for me and not them and the person who hurt me. I have but some distance between me and this person to protect myself and hope for the best with time. Like you said everybody deserve a second chance and we all like but it some are more damaging. This was a situational and big lie that benefited and still is benefiting the person I trusted and the person who hurt me. I may never know why she thought it would be best to lie but for her to dea with and for me to move on so I will be able to grow. I recently lost a friendship to a woman, one who decided that deceiving me about her relationship status was more important than speaking the truth about it. She called me and railed against her boyfriend and told me that it was all over with him. He was back at her house shortly after she finished the conversation and spent the night with her. She lives down the road from me, so I pass her house on the way to town and back. I shot her a text wishing her well with her reunion. They spent the entire day together, as chronicled on Facebook. She eventually texted back that they were just friends and no reunion occurred. Now, I am getting angry and realize that I am being manipulated and played. I sent her a message restating the phone call and what I saw late at night. She was indignant that I drove passed her house and denied that the parked car was her boyfriend’s. She blocked me from FB and started sending indignant phone texts. I called her out and said that I do not like being lied to. Of course, she snickered whatever LOL, and then turned the table on me and blamed me for the situation. I obviously did not lose a good friend, like she stated. I lost a sociopathic liar and manipulator. Very good read, it is easy to forget that the lies are about the liar not necessarily to those they lie to. I was taught so strongly that lies are wrong i had difficulty dealing with the lies about the easter bunny and santa claus when raising my children. What does that teach our young and what might those ramifications lead to? Just curious as to how non liar types deal with the supposedly harmless list of acceptable cultural lies.